Anxiety and depression are common mental health disorders that affect millions of Americans every day. It is important to understand exactly what these illnesses are and how to effectively treat them. Anxiety is defined as a psychological state that is characterized by the exaggerated and persistent feeling of worry, tension, and nervousness. Depression is a mental illness that is characterized by overwhelming feelings of sadness, emptiness, and apathy. This article discusses the causes, symptoms, treatments, and link between anxiety and depression. There are several triggers for anxiety disorders. For middle-aged women, hormone fluctuations experienced during menopause are the primary cause of anxiety. This is because a woman's estrogen levels fluctuate, decrease, and then stay consistently low during the transition. Estrogen significantly affects the brain's regulation of mood and emotions, so when a woman's estrogen levels drop, she becomes more vulnerable to disorders like anxiety and depression. High stress, genetics, and certain medications are other common causes of anxiety. Symptoms of anxiety can be divided into physical and psychological. Physical symptoms can include sweating, dizziness, increased heart rate, shortness of breath, muscle tension, insomnia, and headaches. Psychological symptoms often consist of feelings of dread, intense fear, restlessness, and irritability. Researchers think that depression is most likely caused by a combination of genetic, biological, environmental, and psychological factors. Brain imaging technologies have shown that the brains of people suffering from depression do not look the same as those without depression. The parts of the brain involved in mood, thinking, sleep, appetite, and behavior appear differently; however, scientist's don't understand why this is. As with anxiety, symptoms of depression can be categorized into physical and emotional. Physical symptoms of depression include fatigue, insomnia, increased or decreased appetite, body aches, cramps, and headaches. Emotional symptoms include irritability, loss of interest in activities, and feelings of helplessness, guilt, uncertainty, and in severe cases thoughts of suicide. Anxiety and depression are both considered mental illnesses; however, there is no outstanding evidence that correlates the two. Both disorders can be debilitating, affect relationships, and make every day activities seem impossible. While making lifestyle changes like exercising and eating healthy can help ease some of symptoms of anxiety and depression, getting professional help is also recommended. Anxiety and depression are illnesses and should be treated as such. Talking to a therapist and getting prescription medication can help treat anxiety and depression. 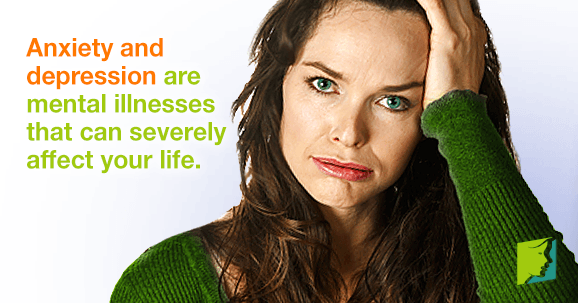 Anxiety and depression are serious mental illnesses that can severely affect your life. It is important to seek proper treatment if you feel you are suffering from either of these illnesses. Anxiety is characterized by the persistent and intensified feeling of worry and nervousness, whereas depression is defined as the constant and overwhelming feeling of sadness, emptiness, and apathy. Therapy and prescription medication are viable treatment options for anxiety and depression.